Doxylamine Succinate vs Diphenhydramine HCL - Which Is Better For Sleep? Insomnia is a condition that is characterized by having trouble staying asleep or falling asleep, waking too early and feeling unrested. It’s estimated that over 70 million people in the United States have trouble sleeping and, with the proliferation of bad habits and gadgets, the problem is progressively getting worse. Due to its sedative effects, doxylamine is used as a short-term treatment for insomnia. Doxylamine belongs to a family of drugs called sedating antihistamines. It is found in over-the-counter products such as Nyquil and Unisom. This drug belongs to a family of drugs called antihistamines which many people use as a sleep aid. Doxylamine is used in the short-term treatment of insomnia. Also, it is used in combination with decongestants to relieve a runny nose, sneezing, and nasal congestion caused by allergies or the common cold. Diphenhydramine is mainly used as a cough suppressant in cough mixtures and as an aid to induce sleep. Doxylamine succinate works by blocking the effects of histamine, a chemical occurring naturally in the human body. Diphenhydramine works by reducing the effects of histamine in the body. severe allergic reactions, including difficulty breathing. Note – this antihistamine causes drowsiness, that is considered a side effect when used for other purposes but a beneficial effect when used as a sleep aid. tightness in your jaw or neck. The usual recommended dose for doxylamine succinate is 25 mg orally once per day, 30 minutes before bedtime. Important note – do not take this antihistamine more than 14 days consecutively. The usual recommended dose for Diphenhydramine is 25 to 50 mg orally at bedtime. if you are a man with prostate problems. it is not recommended for use in children under 12 years of age. Lexapro (used to treat depression and anxiety). Do not drink alcoholic beverages while taking these sedating antihistamines. If you are pregnant or breastfeeding, first consult with your healthcare professional about whether you can use these sedating antihistamines, as it could cause harm. Doxylamine succinate is an antihistamine which works centrally within the brain, where it causes sedation. 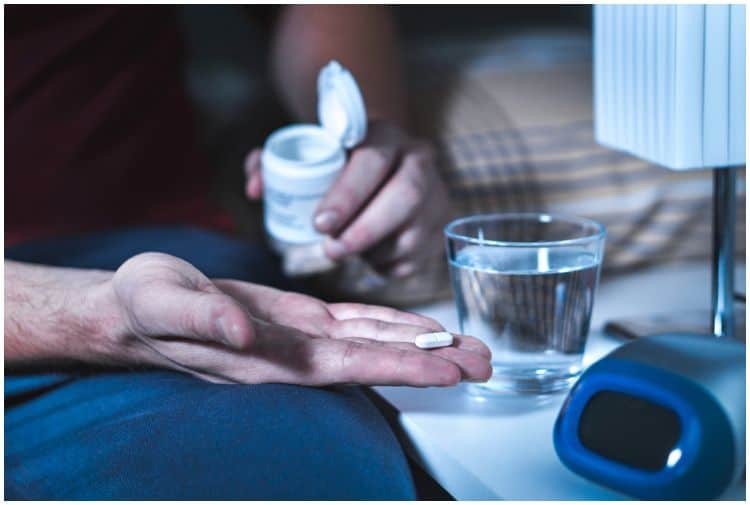 Diphenhydramine is also a sedating antihistamine that is used to induce sleep, to treat motion sickness, and to treat some symptoms of Parkinson’s disease. Also, this antihistamine is used to treat a runny nose, watery eyes, sneezing, itching, hives, skin rash, and other allergy symptoms. Both drugs can help to induce sleep, but research has established that doxylamine succinate is the strongest sedative antihistamine. do relaxation exercises before going to bed, like – mindful meditation or breathing.